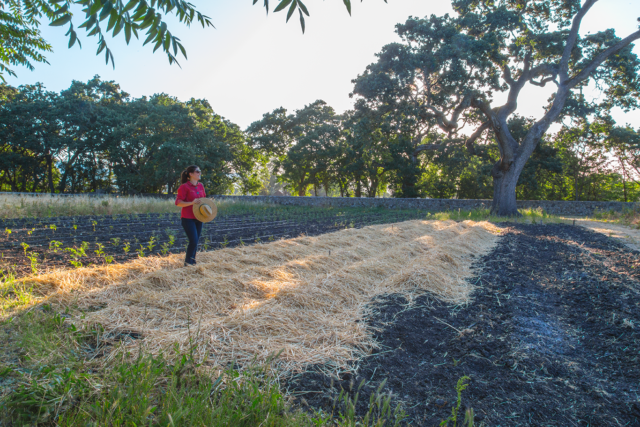 A new report by the National Wildlife Federation (NWF), “Future Friendly Farming: Seven Agricultural Practices to Sustain People and the Environment,” explores a number of important practices to reduce environmental damage and ensure that farming continues to support people for many generations. These recommendations include the use of cover crops, conservation tillage, organic methods of farming, grassland management, forest management, the use of anaerobic digesters to convert methane to carbon dioxide and electricity, and the restoration of native ecosystems on marginal land. Many practices described in the NWF report are already in use by organic farmers. For those of us interested in expanding the use of sustainable agricultural practices, the NWF report demonstrates how these procedures benefit the environment. Let’s start with cover crops: Cover crops are notable because they provide nutrients to the soil and reduce erosion. In particular, legume cover crops such as sweet clover add nitrogen to the soil. This can be especially useful when planting crops like corn, one of the most nitrogen-hungry crops. Cover crop roots also help break up the soil and add organic matter, which can help retain water. They can also provide habitat for different species, such as earthworms and many insects. One of the other key farming techniques highlighted in the report is conservation tillage. Intensive tilling negatively impacts the soil’s ability to retain water by reducing the space between pores and diminishing the soil’s ability to bind together and prevent drainage. Conservation tillage disrupts the soil less, if at all. This allows for greater water retention, which gives crops the ability to survive dry spells and reduces erosion. Also, since conservation tillage disturbs the soil less than conventional tilling methods, it better supports populations of wildlife and soil organisms. Plus it significantly reduces greenhouse gases by sequestering carbon into the soil. Another environmentally beneficial farming practice described in the NWF report is effective grassland and pasture management. Many farmers and ranchers today use continuous grazing, which allows cows and other herbivores to graze the same field for several months at a time. The problem with this is that it limits the growth and recovery of grass, letting weeds and invasive species to out-compete native grasses and lowering pasture productivity. Some farms are adopting a system known as “rotational grazing,” which limits the area available to animals at a time so they can be moved to new fields every few days. Rotational grazing often extends the growing season for grasses, allowing farmers to let herbivores graze for a larger portion of the year. Effective grassland management can also improve water supply, reduce flooding, and increase the organic matter content, improving soil health. Greenhouse gas reduction is very much aided by the use of anaerobic digesters, which reduce methane emissions from animal waste. Methane, a potent greenhouse gas, is 23 times more effective at trapping heat than carbon dioxide. Manure stored in liquid lagoons produces about five tons of carbon emissions equivalents every year. Anaerobic digesters can help with this problem: They use microorganisms to break down the waste, producing methane which is then purified and burned as a fuel to produce electricity, releasing carbon dioxide. Generating electricity this way reduces the need for electricity from fossil fuel sources. Anaerobic digesters also have another advantage: They pasteurize manure to kill bacteria such as E. Coli and salmonella, which can contaminate drinking water. Dr. Tom Kaspar of the Midwest Cover Crop Council provided additional insight into the benefits of cover crops. He said that the best cover crop for farmers to use depends on their location and crop sequence. For example, in Iowa–where he is based–farmers are limited to crops that will survive the winter, like winter cereal rye or winter wheat. But in North or South Dakota, farmers are able to grow several different kinds of crops such as radishes, turnips, spring oats, etc. Kaspar added that the more cover crop growth the better, for both nutrients and organic matter. Kaspar also said that cover crops and no-till techniques go well together. He mentioned how no-till farmers in South America use cover crops, although that hasn’t been as common in the United States. According to Kaspar, no-till techniques benefit from cover crops because cover crops provide some of the same benefits as tilling. Dale Hess, Associate Professor of Agroecology at Goshen College, also shared information about some of the different points in the article. He said that the industrial approach to reducing tillage is to use herbicides to kill weeds. A way to do this without pesticides is to “weed the soil,” or reduce the weed soil seed bank. “Through judicious use of cover crops, fallows, shallow tillage, and crop rotation the soil weed seed bank is reduced (over years), and then reduced tillage and living mulches permit successful ongoing weed management,” he said. Hess said that some of the most common types of cover crops are “…rye, buckwheat, hairy vetch, crimson clover, red clover, sweet clover, cowpeas, millet, and forage sorghums.” Each of these plants has certain advantages over the others and differs in its area of adaptability. Cover crops can maintain or increase the amount of organic matter in the soil “…if they are allowed to grow long enough to produce high herbage,” he said. Hess also said that, in addition to adding more organic matter to the soil, cover crops increase the nitrogen content of the soil for the crops that follow them. This means that less nitrogen need be applied following a productive legume cover crop. For example, corn grown following two tons of hairy vetch will produce high yields of grain with only half the amount of nitrogen fertilizer. Some additional benefits of cover crops are that they suppress weeds, help break pest cycles, and provide pollen and nectar to beneficial insects and honeybees, he said. Bill Minter, Director of Land Management at Goshen College, provided information about another of the seven “future friendly farming” practices: ecosystem restoration. He said that this involves restoring both elements (i.e. species) and functional processes (such as hydrology that will restore water quality, predator/prey relationships, etc.) “If elements are just put back into place, but the functions are not restored, then eventually the elements may disappear or become unbalanced (i.e. deer over-population),” said Minter. “If the natural functions are still in place, then reintroducing/restoring/enriching the elements are more likely to lead to a more stable system (as compared to the pre-restoration state).” The second situation is easier to address, he said. Restoring ecosystem functions can be somewhat more difficult and require more effort and cost, but it has been done before, said Minter. The NWF report is recommended reading for every beginning farmer in deciding the practices that will shape their future farming decisions.